Well it’s that time of year again! We are madly dashing to get our holiday photos done (not the simplest of duties since it gets dark early and rains somewhat often here). Remember that ordering takes a week or so, so plan in advance! We’ll be ordering ours as soon as possible to take advantage of all the deals offered this time of year. Check the websites for the most recent deals, they change weekly. Despite it’s name, Paperless Post certainly does paper, and they do it well. We went through them last year and were delighted with our cards. This year, like many companies, they’ve added gold foil options. Plus, you can also buy the digital version for those recipients who appreciate the speediness and efficiency of emailed cards or to cut down on mailing costs. We also found them to be one of the most affordable, without cutting quality. Note the price does not include an envelope. There’s an option to add envelopes (they work out to be about $1 each), and they automatically come with envelope liners and return addresses. I actually think its a nice opportunity to buy your own envelopes and not be automatically charged. 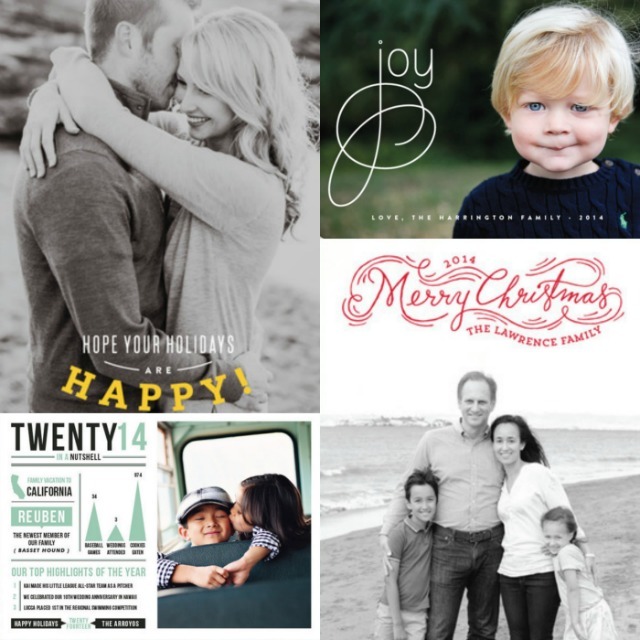 Minted is one of the best in the business. They feature a ton of designs, often from independent artists, so there’s a ton of variety. Their extras are often quite luxurious (gold glitter liner, anyone?) and can tempt you into spending an extra dime or two. There is a plethora of backer options (add more photos or write something personal – this does cost more money), personally I prefer to make use of this blank real-estate when given the option. Holiday orders come with self addressing in a lot of cute styles for free, you can also add return addressing for a small fee – this is worth a ton in my opinion. Envelopes are included and for a small charge you can upgrade to Kraft or silver envelopes. If you have the means, this is the best option. Tiny Prints has so many options including Letterpress! They also have coordinating items so you could potentially have your gift tags match your card design. Pretty cool! The big downside for me is that there is no way to get rid of the Tiny Prints logo on the back – I don’t want to pay for their advertising, especially if I’m spending a chunk of change to begin with and I don’t want anyone to easily look up how much we spent on card designs etc. I prefer some mystery. But they do have a ton of designs and also a ton of deals going on, this option might be the best bang for you buck! Maybe some strategically placed Washi tape could cover the logo? 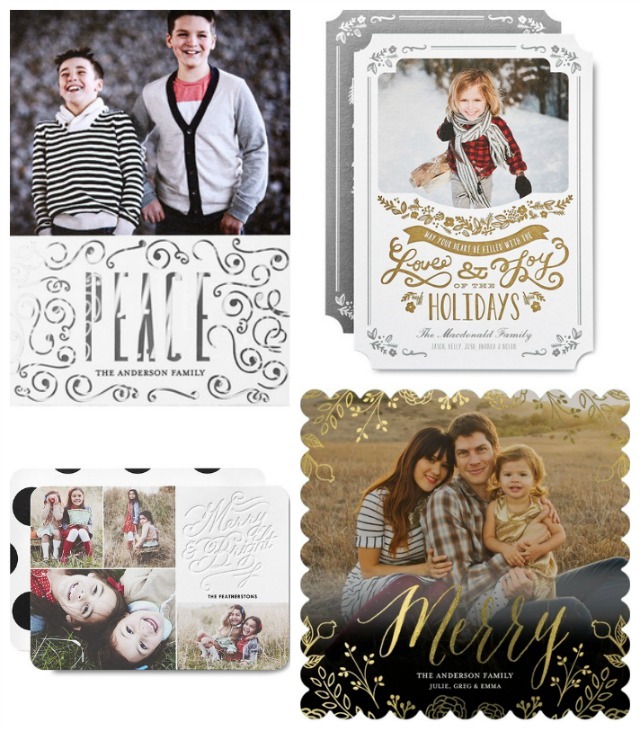 Shutterfly has many beautiful options for holiday cards. 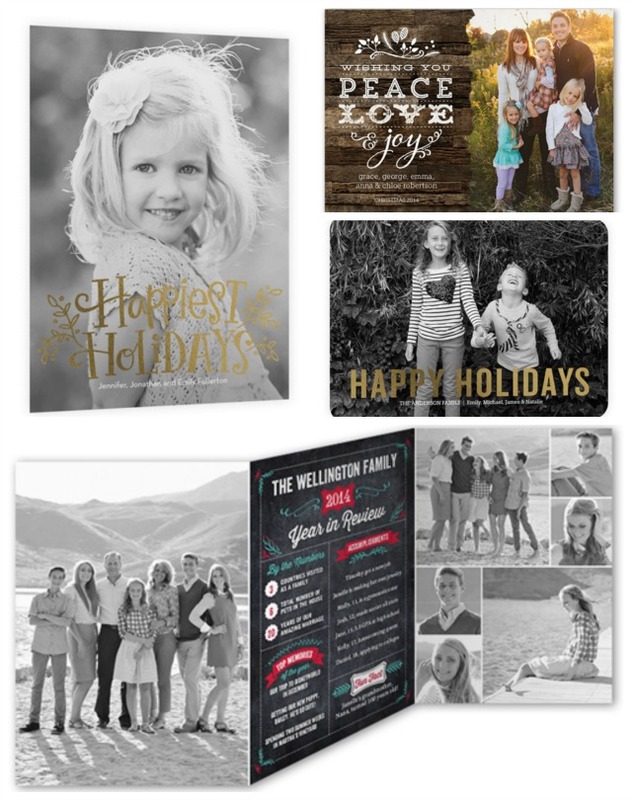 I especially love the option for them to address or send the cards for you for a no-hassle holiday card experience. Again, there’s the logo issue on the back – you can’t seem to be able to select a design or option to eliminate this. Am I the only one bugged by this? I haven’t yet had the opportunity to use Simply to Impress, but I love how easy the site interface is, they have many beautiful designs and have a lot of price points to work with. At $60 for 50 these are the most affordable of the options and they include envelopes. Price just includes a front of a card, but for more money, you can add backer options (which include a logo…) that also doubles the thickness of the paper used, too. Envelopes are included at every price point, but customization for photo liners is limited. There’s even an option for designers to check photo quality before printing and they can even retouch your photos for you (you’ll get a proof to sign off on). Oh, and don’t want the hand cramp that comes with writing addresses, they’ll do that for you, and mail them too, for a small fee. Still need to get your holiday photos done? 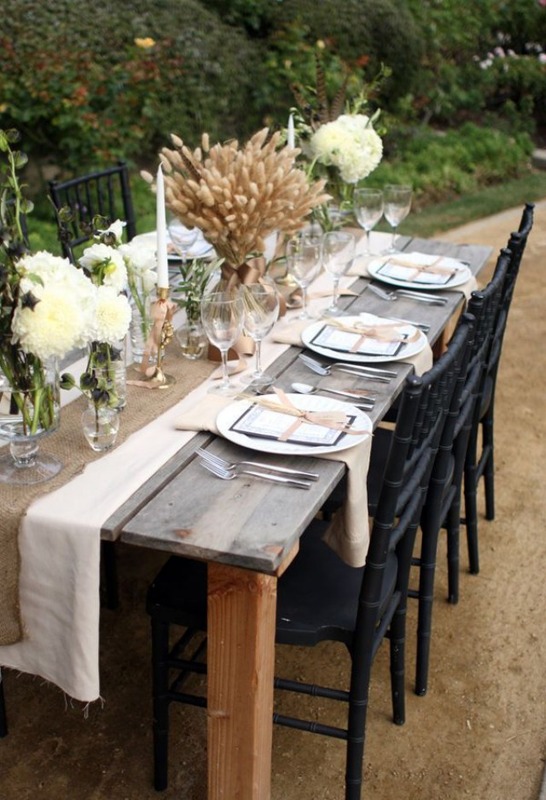 Check out this post for some cute ideas just for couples! Last year we were blessed that we were able to use a wedding photo for our holiday card. This year, we’ll have to put some thought into a Christmas photo! 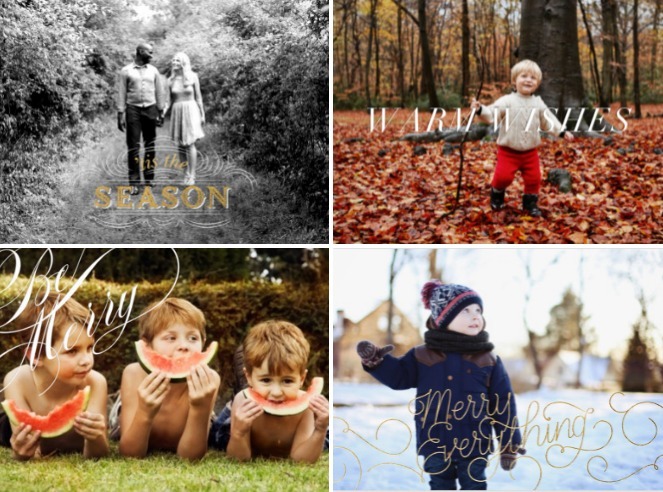 Here are a few holiday-inspired shoots that say “we are a family of two,” well, three plus dog! Cards take a week or two to print and mail (if you’re going through sites like minted or paperculture) , and there’s another week or two while I address and write notes, meaning we need to do this soon to get them out before the Holidays are over! 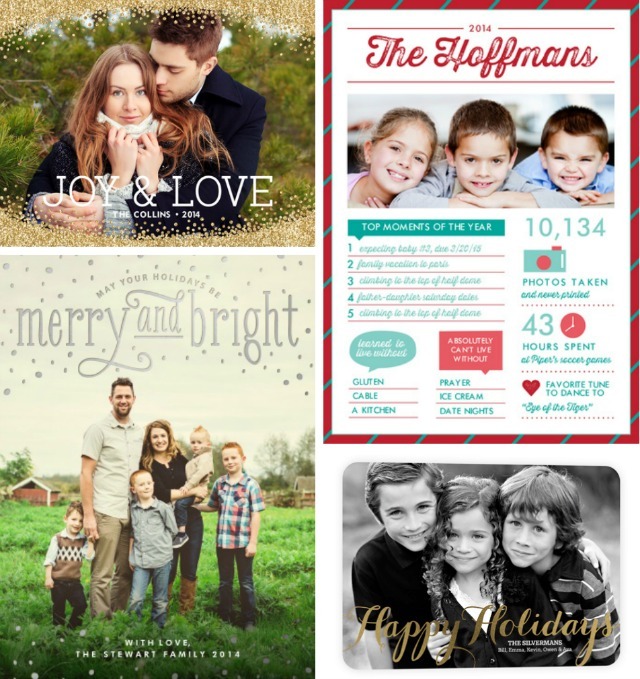 I’d be so interested to hear what other’s Christmas card timeline looks like, so please share! This year we decided we were done with either being bored on Halloween or overwhelmed at bars. So we decided to throw a little party ourselves. Since I wanted our party to be classy, and because I know I will be running around before hand, I decided to keep my costume simple and classy. Oh yes, and reusable, meaning I’m not throwing away $100 plus on something I can wear only once. So in the theme of the black and white party I decided to be a vintage witch. 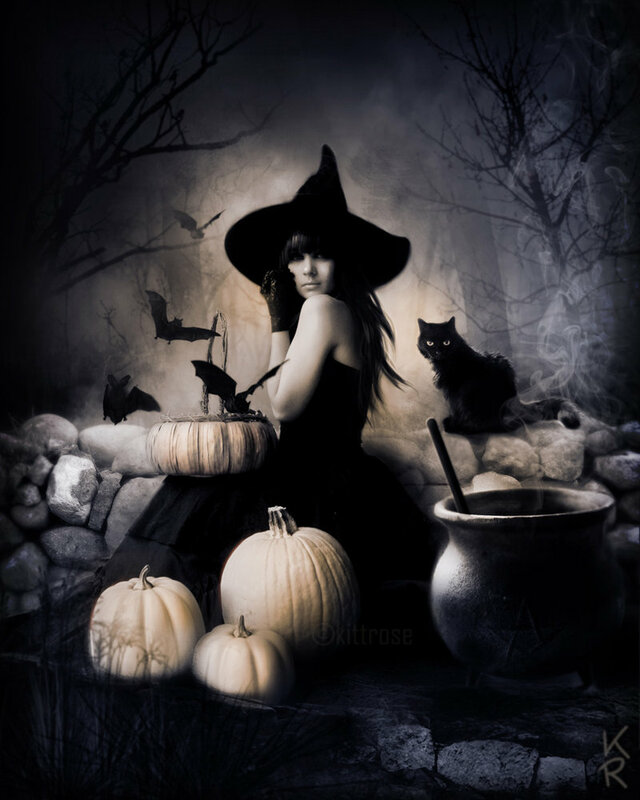 All that’s needed is a black dress and witches hat. Does it get better than that!? We’ve been in our house for about a year and a half (time flies!) and while we’ve had many a parties, we have yet to have an open house where aunts, cousins etc. can visit. No more! 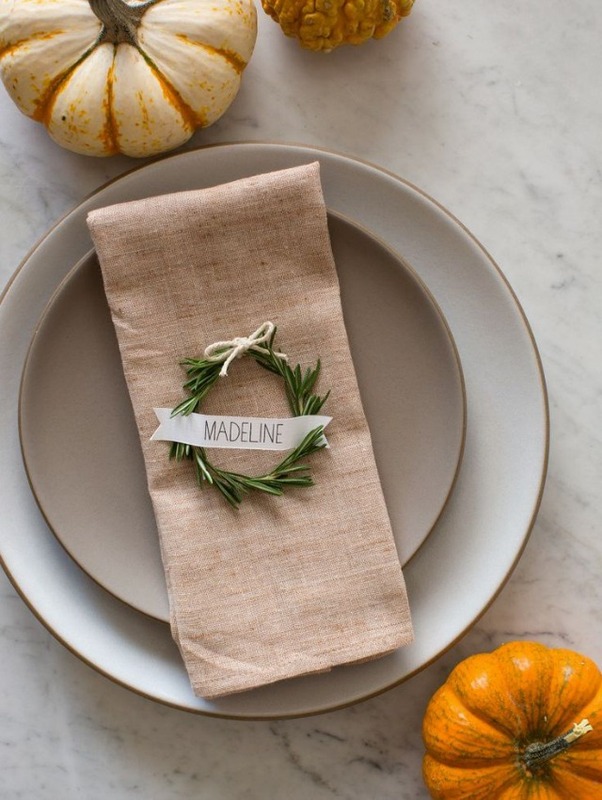 We are planning a fall fête to celebrate summer turning to autumn. 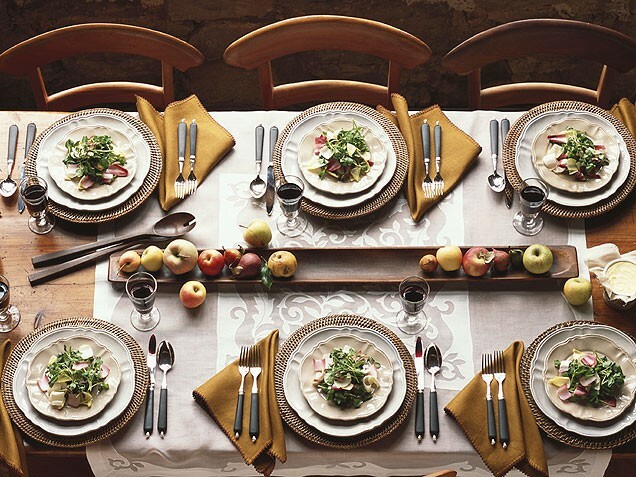 For me, hosting seasonal get togethers instead of holidays is far better. There’s no holiday pressure, no scheduling headaches, and you aren’t tied to the calendar. It’s just a relaxed, happy time. On the other hand, having a little get-together is a wonderful motivator to get a few of our smaller, already-started projects to the finish line. Our fence has been half stained, our crown moulding still waiting to be installed in the living room, and there’s some small paint touchups required. So we are very much looking forward to checking a few more things off our list. Below are a few images we are using as inspiration for next week’s gathering. 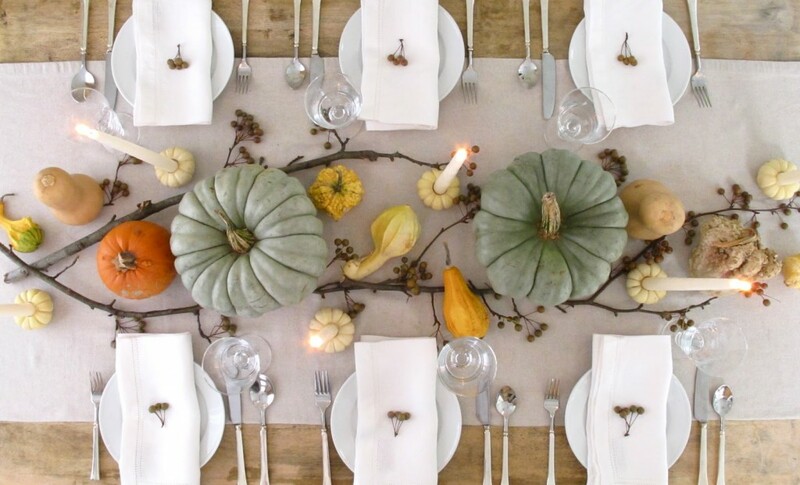 I’m thinking a pumpkin carving station for kids and adults alike, white and green pumpkins as decoration, butternut squash soup, pumpkin risotto, apple pie, and caramelized onion flatbread. Can’t wait to make it a tradition! Billy and I have been doing couple costumes for the last few years and it is so much fun when you have a partner in crime! Though, it can be a tad difficult coming up with costume ideas that your dude is down for (I’m been trying to convince Billy to be the Tin Man from Wizard of Oz for the last few years). 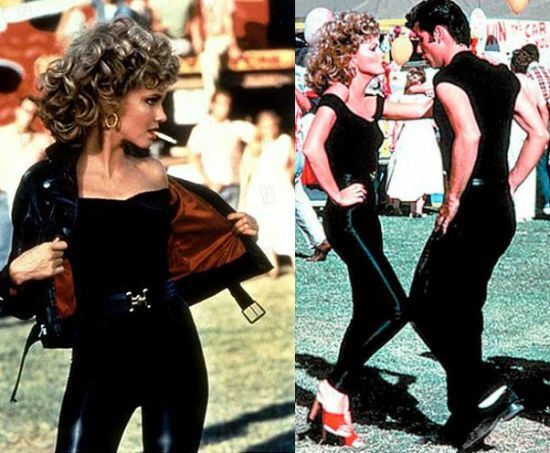 But selling Danny from Grease is a piece of cake. All he needs is a black getup and a leather jacket (oh and gel, lots of gel). Since shopping for costumes = spending money, I like tem to be easily transitioned for use in day to day. So I am looking forward to adding some leather-looking leggings to my wardrobe and finding an awesome off-the-shoulder crop top.